Who could forget the amazing run that the 1988 Kansas Jayhawks went on? Led by star player Danny Manning and his inimitable coach Larry Brown, the Jayhawks won their first National Championship since 1952. After a 20-year National Championship drought, guard Mario Chalmers and head coach Bill Self propelled the Jayhawks to another victory on college basketball’s biggest stage. For many Jayhawk fans, those indelible moments are permanently etched in their minds and that championship feeling is a constant reminder of why each college basketball season is so fun and exciting. Do you ever wish you would have bought more commemorative items after those or other big games to help celebrate the night? Luckily, you can travel back in time by investing in historical Kansas Jayhawk posters. In addition to posters from the championship seasons, we also carry hard-to-find poster from Final Four years, as well as posters of some of the most famous players to wear Jayhawk blue. Also, if sports collectibles aren’t your thing, we also have limited edition artwork that highlights the history and beautiful geography of Kansas. If you’re interested in one of our historical KU posters, simply call us to inquire about the price and availability of your selection. 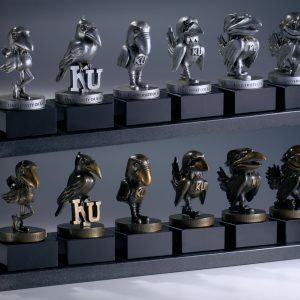 Should your first choice not be in stock, we will do whatever we can to track it down for you, as we sell and buy historical Jayhawk posters. Please call us at your convenience for prices, or if you would like to sell back an old Jayhawks poster that you have lying around your home.